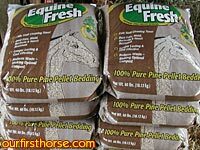 If you use wood pellets for horse bedding, you may have heard of the brand Equine Fresh. There are many brands of wood pellets out there and I suspect there will be many more since wood pellets are quickly becoming the preferred bedding for horse owners around the U.S. But the reason I’m writing this note about Equine Fresh is because it’s the brand carried by Tractor Supply stores. Until recently Tractor Supply also carried Woody Pet, perhaps the most well-known wood pellet bedding brand. But we have it on good authority that Tractor Supply decided to stop carrying Woody Pet in favor of the less expensive and larger-portioned Equine Fresh bags. As I recall, Woody Pet was in the neighborhood of $7 a bag for 35 lbs. while Equine Fresh is around $6 a bag for 40 lbs. We’ve tried both and haven’t noticed any difference in the two, so we’ve been buying Equine Fresh exclusively…until today. It seems all of our local east Tennessee Tractor Supply stores are completely out of Equine Fresh and, of course, Woody Pet. Turns out the Equine Fresh people lost their sawdust supplier and are frantically looking for another one. In the meantime, their inventory is almost depleted, which means no more shipments to Tractor Supply (or anyone else, for that matter). Of course, Tractor Supply sort of burned the bridge with Woody Pet, so they simply don’t have any wood pellets in stock at all now. Rumor has it there is a small shipment of Equine Fresh coming in to one of our local Tractor Supply stores (and I’m not telling which!) that is expected to be sold out practically before the pallets hit the pavement. Drama in the wood-pellet industry! Who knew it could be this exciting? So why all the fuss over wood pellets? Well, I’m not sure I’d go stand in line for some, but I will say we’re converts. Without rehashing all the benefits, allow me to refer you to our post about using wood pellets for horse bedding from last year, entitled “Serta or Tempurpedic?“, referring to the relative luxury of the soft pellets versus some of the alternative bedding choices. You can see pictures of the wood pellets in detail in that post. We managed to find an alternative supply of wood pellets locally at Co-op but they were more expensive. We paid around $6 per 35 lb. bag. Hopefully Equine Fresh gets their raw material supply problem worked out soon. The source of information for this article sounded ominous, though: “If they don’t find a supplier soon, they’ll probably go out of business.” He did assure us, however, that if Equine Fresh goes under, they’ll find another company to fill the need. I’m rooting for Equine Fresh, though, they have a good deal going. So if you use Equine Fresh and your local Tractor Supply or other farm supply store still has some, you might consider heading down there asap to buy all you can. We’re seriously thinking of stocking up on wood pellets by buying a pallet or two next time. We could probably get a price break, too. One more thing…Equine Fresh is made in Canada. So is Woody Pet. And all the other wood pellet horse bedding manufacturers we’ve ever seen in these parts. I wonder why wood pellets only seem to come from Canada. Do any of you know? Just curious.